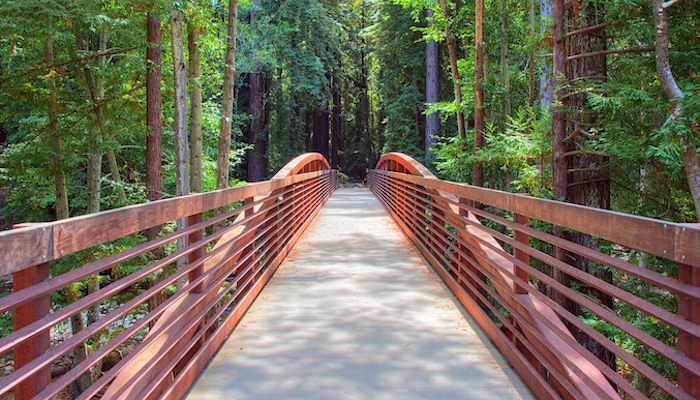 This 1,000 acre state park is at the heart of Big Sur, and centered on the Big Sur River. Wonderful trail running, with excellent variety — from coastal forest to oceanside views. Note: Due to landslides in the spring of 2017, many of the trails in Julia Pfeiffer Burns Big Sur State Park and surrounding parks are closed for restoration. Currently, the best trail running in the park is the Buzzard’s Roost Trail, a moderate three miles loop from the Cabrillo Highway. From the trailhead, the path follows a shady redwood grove along the Big Sur River. Runners will get a nice hill climb in on the way up to the Roost overlook, a sunny ridge where you can enjoy expansive views stretching out across the Pacific Ocean in one direction, and the Santa Lucia Mountains in the other. The trail is fairly narrow single track, and mostly gravel, but it’s well maintained enough for solid running footing. The best conditions are from March until October. Note: As of February 15, 2017, Highway 1 is impassable in both directions at Pfeiffer Canyon Bridge (about half a mile south of the Big Sur Station). Currently, northern access to Big Sur is open from Carmel to the Big Sur Station. Several park trails are also closed for renovation.